Happy Wednesday everyone! Rosemary here with a clean and simple card that I made using the new Open Daisy die set. This die set works with the Daisy die set as well as the new Dancing Daisies cover plate die. 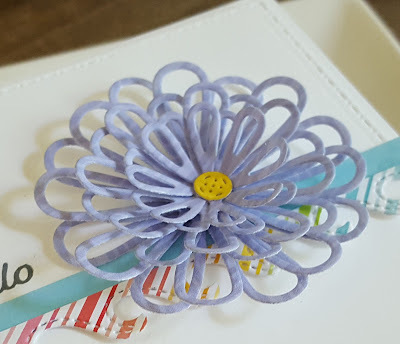 I recently got the Open Daisy die set as well as the Dancing Daisy cover plate die and had originally thought I would use the two together, but then I saw the fun sketch over at Fab Friday (thank you to the team for picking my card from a few weeks ago found here as one of their Fab Five!) and decided to just use the Open Daisy dies by themselves. I pulled out some fun Lawn Fawn patterned paper that I have had for awhile and die cut each daisy from the paper twice. I then layered each set by offsetting them. Once each set was dry I adhered all of them together to create a flower that looks a bit more like a chrysanthemum then a daisy. I lifted up the petals to give it a bit more dimension as you can see it the photo below. For the other elements in the sketch I die cut another piece of coordinating paper using the wave die that comes in the Anchors Aweigh die set. I then trimmed it down, flipped it upside down and adhered it to a strip of coordinating paper. White cardstock was die cut with the largest Stitched Dot rectangle and the strip element was adhered to that. 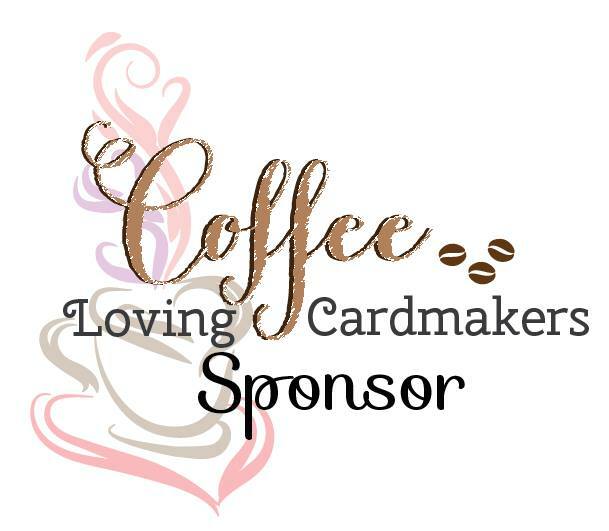 I then placed the piece in my stamping tool, inked up the sentiment (from Aloha) with Catherine Pooler Black Jack ink and stamped it. 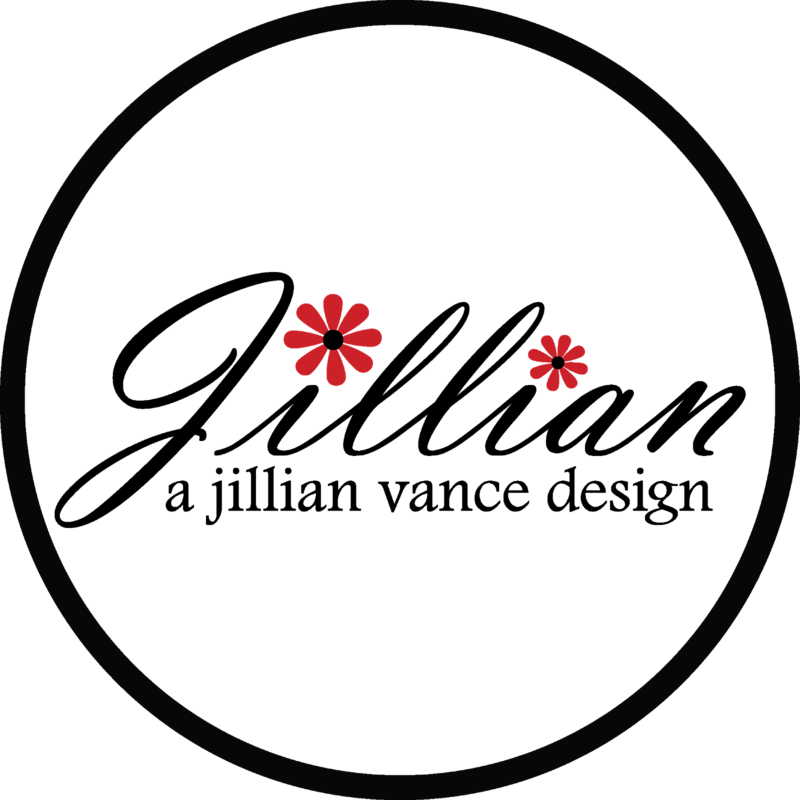 The flower was then adhered and the center added. The entire piece was then adhered to my card base. Going to try layering more of the die cut daisies to see just how full I can get it. Perfect use of the sketch, Rosemary! 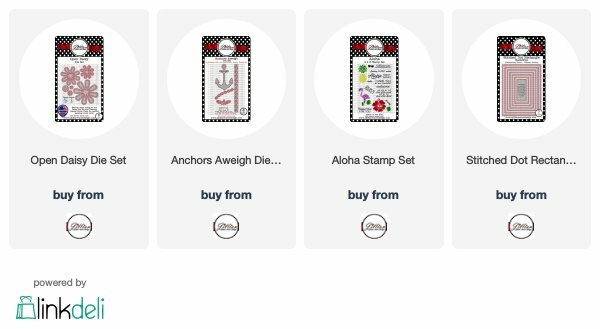 I absolutely love the new flower die--onto my wishlist! You are the queen of CAS--always so much interest & great use of color! Oh, how pretty! I love your clean design and the colors are perfect! Thanks for joining us at Fab Friday, hope to see you again soon! Just love the layered daisy atop the striped & stitched upside-down waves, Rosemary! Clever way to stretch those dies!! Love how you layered all of those pretty flowers together and that sweet border strip below is the perfect accent! What a pretty layered bloom! This is wonderful Rosemary, love your design! Oh wow, what fun layered dies - love those flowers! 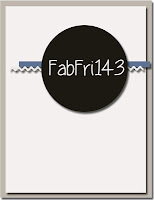 That little wave border is super cute, too - love your color choices here! Thanks so much for playing at Fab Friday! What a perfect set of dies to use for our challenge! I love how dainty they look layered like that. A lovely 'hello' card! Thanks for sharing at Fab Friday!